Don't Lose Your MMS Benefits - Renew Today! Since the announcement and departure of MMS's longtime executive director, Cynthia Melody, the MMS board of directors has been in negotiations with the San Francisco Medical Society (SFMS) to merge the two organizations. SFMS Executive Director/CEO, Mary Lou Licwinko, and her staff are currently handling MMS administration. While there are many issues yet to be resolved, the merger should be complete by springtime. The leadership of both organizations aims to have a seamless transition and ensure that MMS members will not experience any disruption in their member benefits. If you have questions or concerns, you are welcome to contact MMS, or you can reach Dr. Peter Bretan, MMS President, at (415) 271-1192 or bretanp@msn.com, or Dr. Michael Kwok, President-Elect, at (415) 925-3617 or mkkwok5@gmail.com. 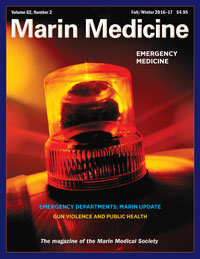 This issue focuses on emergency medicine and features a special section with hospital reports on emergency care in Marin. Other theme articles include the ER, patient education and Kaiser's telestroke program. Departments cover a wide range of topics ranging from gun violence and public health to the fall House of Delegates. A Resources Spotlight offers tools and resources for solo and small group practices, and a photo spread from the MMS Awards Dinner rounds out the issue. Available online or in print. The California Medical Association (CMA) will host its 43rd annual Legislative Advocacy Day on April 18, 2017. Join MMS at the State Capitol to learn about legislative issues affecting medicine, foster relationships with state legislators, and gain hands on experience in the practical aspects of physician advocacy. MMS members will have the opportunity to meet with legislators. All meetings with legislators will be scheduled and coordinated by MMS. Registration information will be available soon. Meritage - a Novato-based nonprofit network of 700 physicians that serves residents in Marin, Sonoma and Napa counties - has won the first round in a court battle with St. Joseph Health. In July, Meritage sued St. Joseph Health, an Irvine-based hospital organization with more than $5 billion in annual revenues, alleging that St. Joseph illegally obtained confidential information that gave it an unfair advantage in its competition with Meritage. Marin Superior Court Judge Geoffrey Howard has issued a preliminary injunction preventing St. Joseph Health from using the information. A trial is scheduled for June 15. Read more. In a recent landmark win for organized medicine and the nation's patients, federal judge John D. Bates blocked the proposed Aetna-Humana merger. The judge found that the merger would have substantially lessened competition in Medicare Advantage and commercial health insurance markets. The decision is an historic, stunning affirmation of the position urged by the American Medical Association (AMA) and the 17-state medical association antitrust coalition members. The court's ruling sets a notable legal precedent by recognizing Medicare Advantage as a separate and distinct market that does not compete with traditional Medicare. Don't let this be the last member eNewsletter you receive from MMS! Please renew your membership today before it lapses on March 1. Click here to renew. A detailed step-by-step guide from Partnership HealthPlan is available to help clinicians taper opioids for patients with chronic pain. The toolkit includes case studies and guidance on management of complications. Partnership HealthPlan designed the toolkit as part of its Managing Pain Safely program. Physicians should be aware that approximately 35,000 Californians insured through Covered California have, at least temporarily, lost federal premium subsidies or are facing higher-than-expected premium bills due to clerical errors by the state health exchange. Physicians who receive questions from their patients about either of these issues should direct them to contact Covered California directly at (800) 300-1506. Click here for more information.